Beautiful quilt! Love the colors and well made. Add a pop of fresh color to your bedroom with the Kathryn quilt set. 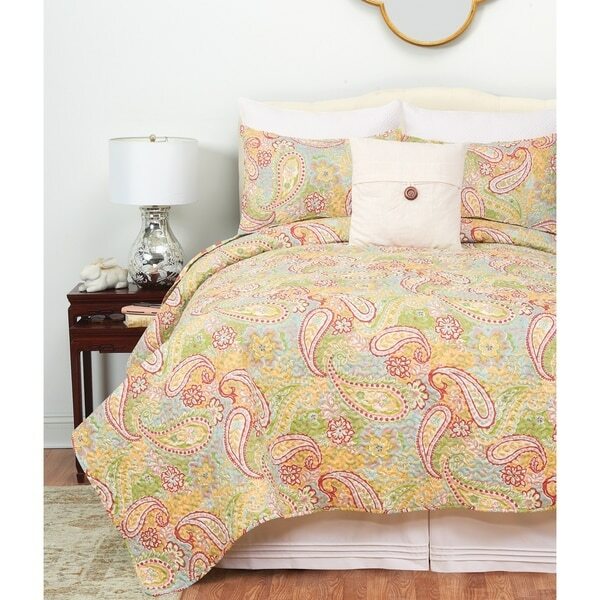 Featuring a fun and airy paisley design in green, pink, yellow and blue this quilt is sure to remind you of sunny days. Ready to change up your look? Kathryn is reversible to a coordinating fun stripe. Finished with a fabric edge and vermicelli stitching this quilt is sure to delight. Crafted of soft microfiber, this quilt set is machine washable for easy care. All over print featuring a fun and airy paisley design in green, pink, yellow and blue. Dimensions 90.0 In. X 104.0 In. X 0.5 In. Love this! It’s going to be great in the new house!